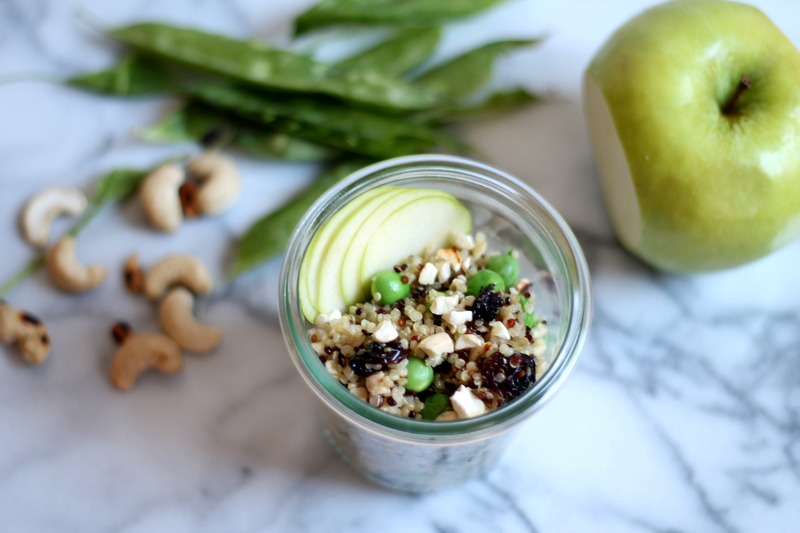 Hearty Spring Quinoa Salad, packed with dried fruit, roasted cashews, and fresh spring peas – perfect for lunch or as a side dish for a picnic! Plus, we’re celebrating a healthy spring with KitchenIQ, so be sure to scroll down and enter to win an awesome giveaway! 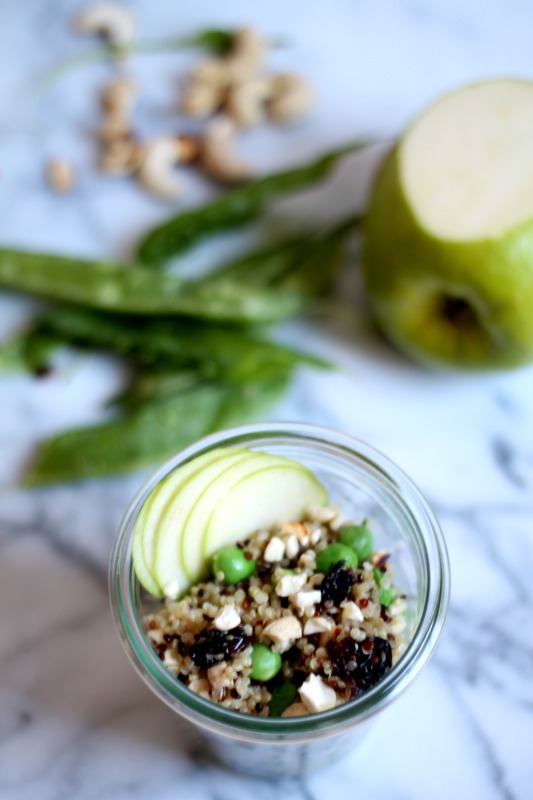 Packed with roasted crushed cashews, plump raisins, and fresh spring peas, this quinoa salad is the perfect salad to bring to a picnic outing or even serve as a side dish for dinner. I’ve added some very thinly sliced apples for texture, and the thin slices were aided by having an extremely sharp knife. One cannot say this enough, but a dull knife is the most unsafe knife in your kitchen. A dull knife will slip while you’re cutting and will make you put extra pressure on your knife to help you cut through your foods. That extra pressure is what ends up in a bloody mess. So friends, please do yourselves a favor and sharpen your knives. 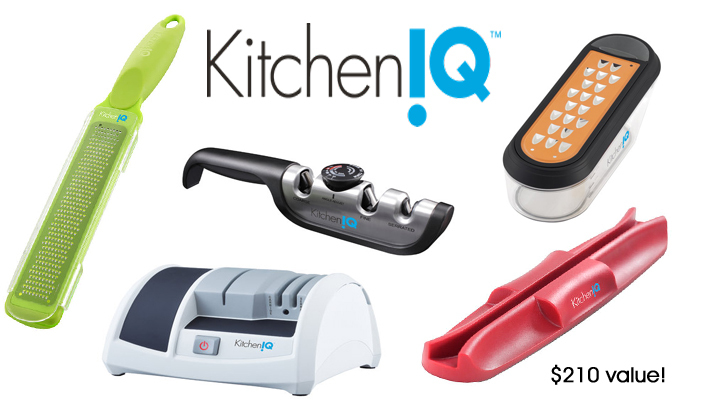 And to aid int he knife sharpening, I’ve partnered up with KitchenIQ, creators of some great tools to sharpen up your kitchen skills, literally. Their Diamond Edge 2 Sharpener now lives on our kitchen counter – as chefs, a dull knife makes us so mad! Be sure to scroll down and enter this great giveaway! This hearty salad comes together in under ten minutes if you've got cooked quinoa in the fridge! Toss all the salad ingredients together. In a separate small bowl, whisk together the oil, vinegar, and salt. Drizzle dressing over salad and serve alongside thinly sliced apples for added crunch! 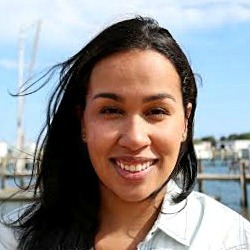 Be sure to check out what my other blogger friends have made! 1.Kelli of Kelli’s Kitchen – Cornish Hens with Mango Avocado Chutney. Right now I really like the Cooking Light Chicken Enchilada Verded recipe. Thanks for the opportunity! Grilled salmon, brown rice3 along with sautéed asparagus. My family enjoys that dish. I like making healthy green smoothies. My favorite healthy meal is breakfast for sure, it starts my day off right. I make old fashioned oats on the cooktop and add in quinoa and teff that’s prepared in advance. Ordinarily I mix in chia seeds, flaxseeds, walnuts, banana, dried cranberries and a drizzle of honey. Kale and quinoa salad – loaded with veggies and nuts. That salad sounds great!! I might put craisins in mine instead of raisins. I guess one of my fastest healthy things to make is a yogurt parfait with fresh strawberries, blueberries, a little lowfat granola and chopped nuts to top; and sometimes a few chocolate shavings from a good dark chocolate bar. I could really use the sharpeners my knifes are starting to get dull and it’s bugging me. Fresh fruit and berry salads when they are in season. I love a good quinoa salad and this looks delicious. Love the presentation. I love the combination of salty and sweet with the nuts and fruit and also the fresh and dried fruit combo – great idea!! sounds delicious! Oooohhh love the addition of cashews in this!! 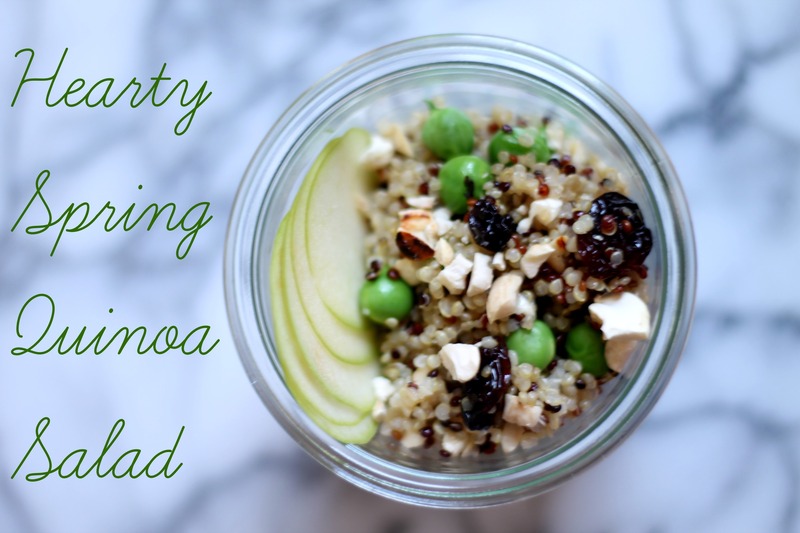 Now I know what to make with my leftover quinoa!!! SO simple, healthy and yummy!! !